Sign up for our new Clearance Deals alerts! Headlight bulbs: Kelvin vs Lumen – what’s the difference? ECCO 13 Series Lightbars: Special offer extended for September! Green flashing beacons: Why use them on diggers and dumpers? ECCO 13 Series Lightbars: Special offer for August 2018 only! HS2: Vehicle safety – are you ready to go on site? Lighting up time is getting earlier, so are you ready for it? Solved: Redtronic LED Lightbar Stuck In Single Flash Mode? Fuses Vs. Circuit Breakers – What’s The Difference? IP Ratings – What Exactly Do They Mean? LED worklamps are fast becoming the 'go-to' work light, as they hold many benefits over their halogen rivals. You can browse our range on dun-bri.com - click here to browse. One the major differences when choosing a Dun-Bri Group own-brand work light is the lumen output rating. Most manufacturers list the raw (theoretical) lumen output, where it could be achieved in a perfect world. We list our own-brand ranges in effective lumens, the actual output once the unit has reached its operating temperature. Why do we do this? It's the most reliable and honest rating and is taken once the light has been operating for two hours. It will show a decrease from the raw lumen value due to physical-related losses in optics, reflectors and heat. 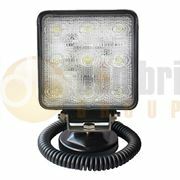 We only display the light that you will be working with and as such, is the most reliable reading to consider when looking to purchase new LED worklights. Halogen lights can have a lower price and they do provide a reasonable level of light. Their downfall is the bulb; once blown you are forced to stop working to replace it, and this then impacts on revenue and productivity. In a previous post, we discovered that although the initial cost is higher the overall cost was lower to fit LED worklights. LED’s offer reduced energy use, which decreases running costs and helps prevent downtime and loss in earnings. The outlay for LED Worklights are repaid, on average within 24 months and after 8 years can save as much as £1,721 compared to halogen lighting. You can find out more in our post by clicking here. LED’s draw less power than halogen bulbs reducing the strain on your machine battery and alternator. This ensures more power is available for other applications such as GPS, onboard computers or more lighting to the area around your machine, all, in most cases, without increasing the capacity of your alternator. Fuel saving is also a benefit – with lower energy draw, fuel consumption is reduced and so are costs. We've even figured out that on a vehicle fitted with two beacons and three LED worklights could save 91 litres of diesel a year! As LED worklights can be placed in smaller spaces, owing to their compact size, you can use them in restrictive areas for better illumination. From lockers and steps to wide open spaces, we'll have an LED work light that it fit for the job. The LED worklights we sell under our own-brand, typically emit a light with 5700°K colour temperature. This is near the colour spectrum of the midday sun, and so allows the human eye to function and view objects better. In comparison, the halogen bulb emits a colour of around 3000°K. All of the lighting we offer under our own-brand is E approved. From ECE Regulation 10 for EMC compliance, to ECE Regulation 7 for those which can be used for reversing - they're all covered giving you peace of mind. This is in addition to general testing, even in the harshest of environments. They undergo rigorous testing during selection to ensure they can hold up to the punishment of life in the field. LED’s use solid-state construction so there are no breakable bulbs, fragile filaments or sensitive electrodes like those in halogen or xenon HID lighting. This means LED’s are the ideal choice for vehicle applications where rough terrain or vibration would cause traditional work lights to fail. 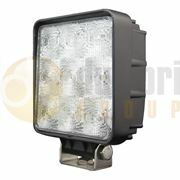 For example, their use on dumpers and plant machinery is not an issue compared to halogen bulbs. Lighting - flood or spot? Ultimately the choice is yours. We have a range of LED worklamps with a variety of lens patterns to project the light to where it is needed. This ensures the right amount of light is delivered and avoids causing glare to those working around the machine and other operators. The majority of our LED worklamps are IP67, or even as highly protected as IP69K. Compared to traditional halogen work lamps, they have far greater weather protection - keeping them on the road for longer. As with any Dun-Bri Group own-brand product, we have an unbeatable product warranty. Our warranties range from one to five years on our range of LED worklamps, beacons and lightbars - if we sold it, we'll sort it. Ask us about it today.